Everyone knows that the best-tasting holiday cookies are the ones made from scratch with fresh ingredients and a lot of love. The same goes for gifts. Southern California’s indie presses are cooking up unique, reasonably priced poetry and fiction appealing to almost every taste. Check them out online or visit an indie bookstore, and enjoy the warm holiday feeling that comes from knowing you supported local artists and businesses instead of overseas sweatshops and multi-national retail chains. Here are a few presses and stores we recommend. Happy holidays from the Future of Publishing Think Tank*! *The Future of Publishing Think Tank is an ad hoc group of writers and representatives of independent publishers and bookstores, nonprofit literary organizations, and producers of public radio. Our task: to consider the changes occurring in publishing, distribution, and marketing of literary work and to envision new ways for writers to engage readers and build audiences for their work. Groups who that have been involved include 826LA, Arktoi Books, GuerrillaReads, the HeArt Project, Hol Art Books, “Indymedia on Air” (KPFK), the Lambda Literary Foundation, Les Figues Press, Poet Joi, Poets & Writers, Red Hen Press, Skylight Books, and Writers at Work. Earlier this year, the Future of Publishing Think Tank surveyed readers to find out how and why they choose the books they read and buy. Armed with that information, we have some recommendations for how writers, publishers and booksellers can promote their work and connect to readers. Here’s a short video summarizing the basics. To see the full slideshow with all the results and recommendations, click here. To embed this short video in your blog or website, you can grab the YouTube version here. If you want to embed the full slideshow in your blog or website, contact us for details. If you have ideas on how writers, publishers and booksellers can promote their work, add your comments below. We’d love to hear from you. 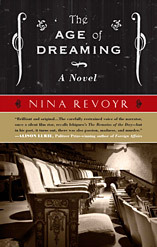 Over the course of three novels, Nina Revoyr has chronicled girl basketball players, civil unrest in Watts, and now the silent film era: The Age of Dreaming is the story of Jun Nakayama, a Japanese American star of the silents who—when a new part comes his way for the first time in decades—is forced to reflect on the abrupt end of his career. The reasons are as scandalous as an unsolved murder and as subtle as the growing anti-Japanese sentiments he tried to brush off. The through-line that draws me to Revoyr’s work again and again—besides her insider’s renderings of Los Angeles—is her depiction of characters who are reluctantly shaken out of their passivity. It’s easy enough to write about characters who are brave or even tragic, but it takes serious skill to write about polite, reserved people whose very nature defies the nature of plot. Over the course of the novel, which flashes between the ’20s and the ’60s, Jun realizes that society doesn’t reward patience and compliance the way he’d hoped, but that he has more control of his own fate than he once thought. Revoyr’s prose in this novel are like Jun himself: simple but elegant, contemplative and—at first glance—almost dry. But this is all part of a carefully layered character portrait, and the thoroughly juicy mystery at the novel’s center, coupled with descriptions of Hollywood in its giddy adolescence, keep the pages turning. I’m a proud member of Writers at Work‘s Tuesday night group, One Page at a Time, and I have some great news. My short story, “Cola Hard Cash,” was just published in the online literary magazine, The Battered Suitcase. If you can, please help me get the word out about Cola Hard Cash. Of course the best way to do that is to read it and let me know what you think. I’d love to hear from you. You can add your comments below. Digg it. Just click the yellow Digg icon to the right of the author bio and follow the instructions. If you have a blog, Facebook, MySpace page or other website, add a link to the story. Share the story with anyone you think would be interested. P.S. Thanks to Terry and all my fellow One-Pagers for your feedback and advice.